How would you fit 127 hours in a 90 minute film? It is a genius work. 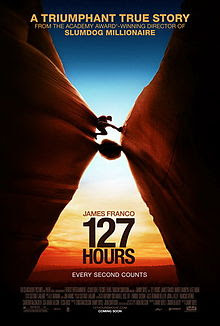 127 Hours is a great movie, especially after finding out that it is a true-to-life movie of a mountain climber, Aron Ralston who had been trapped by a boulder. Oh yeah, I don't read movie summaries and ads, I never know this is a real story. [SPOILER ALERT!] He survived 5 days with just the usual stuff that he brings when climbing mountains - backpack, ropes, camcorder, camera and a knife (he says just an ordinary knife)- which he used to amputate his right arm (the lower part below the elbow). Okay, so that's not how exactly he got trapped in the boulder. It is a nice poster, by the way. This movie is not for those with weak hearts (I included!). There are parts in the movies which are too graphic that I chose not to look, so technically I missed around 10 or 15 minutes of that movie. While trapped in the boulder, he reflected about his life, thought about his family and friends, his ex-lover and his will to survive. This is a serious movie, and a one-man movie which shows how a man would do everything to survive from taking the last drop of water available, to entertaining himself while recording his frustrations and realizations. The radio show part is what I love the most, next to the part where he has finally freed himself. For a while I thought, if being alone would make you hallucinate and see things?! So he managed to rappel down a 65-ft wall and walk back from the canyon until he met a couple and son who gave him water and called for rescue. 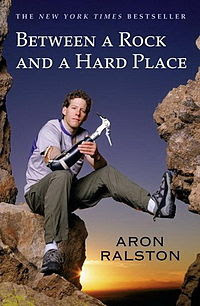 I love the ending of his story and how he has live his life still climbing mountains and doing inspirational talks. Another must-see movie for 2011 from the makers of Slumdog Millionaire. For a second I thought, I should stop going extreme and trying new sports and hobbies, but hey, he managed to survived so I guess all we need is just trust in God and a swiss army knife.